Yesterday I completed one of our 3 Day Market Timing Orientation Events at my local Philadelphia campus, where prospective new students of Online Trading Academy come to explore our educational solutions and learn more about the application of our patented Core Strategy. During one of the breaks, I sat down with one of the new students who had just enrolled in the Academy and she was telling me how excited she was about her upcoming education, but also a little nervous because she was new to the markets and felt like she had less experience than some of the other people in the orientation. She also asked me how I found the time to both teach and trade, as she was a little concerned about not being able to put the necessary hours into her trading. I love it when people ask me how I get time to trade. They seem to think that I sit in front of the PC screen all day and that I must be there every minute of every day clicking buttons to trade! If that were the case, I would have quit trading a long time ago! I told her that many people ask that question, especially considering our commitment to students and teaching for Online Trading Academy. Well, many people look at the financial markets in the wrong way and do the wrong things, they also tend to have the wrong idea of what trading really involves on a day to day basis. Ninety percent of market speculators in the world today tend to breakeven or, worse yet, they lose money on a consistent basis. The main reason why this happens is not because they don’t have a secret indicator or trading robot, but mainly because of the mindset. The average trader looks at the markets through the eyes of a retail trader. The major institutions out there today look at the markets through a very different set of eyes altogether, and that is what we train our students to do as well. You ask the retail trader what it takes to make money in the markets and they will often say that you need the most cutting-edge analysis skills or data feeds to make it work, combined with thousands of hours of screen-time at the charts, decoding the secret messages within the candles! Do you really think that the major investment houses and funds sit there each and every day picking candle patterns to make their moves? It couldn’t be further from the opposite. Institutions are nothing more than businesses which seek to buy low and sell high, building strong positions in the markets and managing their risk. They create the major moves in the markets which the news services then justify with fundamentals after the rally or drop. The chart above is a set up I was showing the class which was of interest to me a few weeks ago on the GBPUSD. 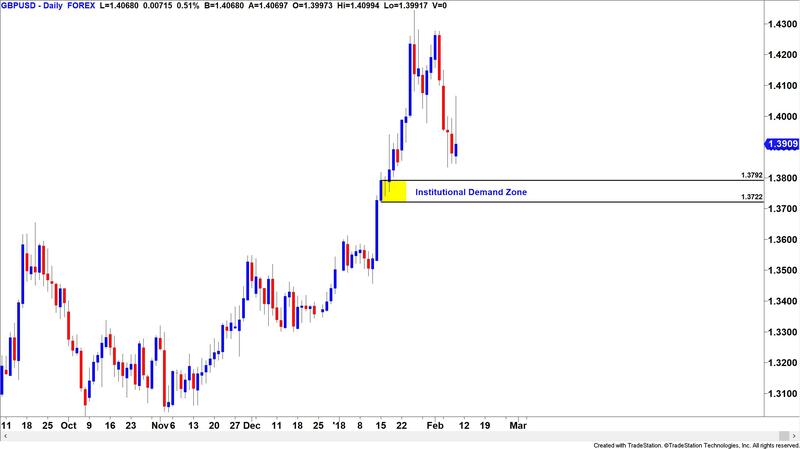 Notice how we have highlighted the Demand Zone at 1.3792? The way prices reacted at that area suggested to me that there was some heavy institutional buying in that area last month and clearly their orders didn’t get filled as price moved away from the area in such a strong fashion. 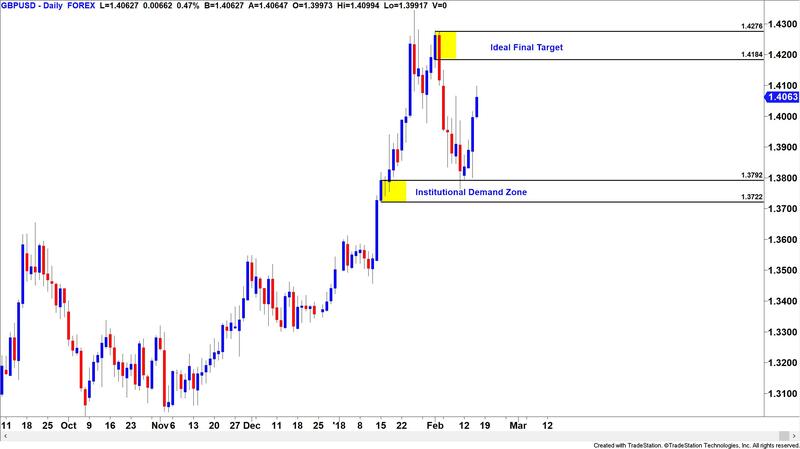 This offered us a great low risk buying opportunity on the GBPUSD with a stop below 1.3722. Considering we now know where to buy, we can set and forget this trade and put the orders in ahead of time, giving us freedom to focus on other things. Now, to the untrained eye, this is the time to start shorting the market aggressively because the perception at the time is that something bad has happened and we should get in before it drops harder, especially as the GBPUSD is going down, and the amateur tends to follow the trend. To most out there buying is perceived to be high risk, but to us the actual risk is tiny in comparison to the potential reward. The trade at the time of writing is already over a 3:1 reward to risk and still going to target. We can lock in profit safely with a trailing stop if we choose and get short at the supply with another set and forget. If the short fails, then we will still be in profit from the earlier long trader and we didn’t even sit there watching it all happen. Think about how simple this plan was. Did it take any more than to look at the chart, set the entry, stops and targets and leave well enough alone? Did we need to be there through every second of the trade? Of course not, but still the retail mind finds trading far from easy because it has been trained to think whereas the institutional mind has been trained to act on what it sees and by its plan, no more no less. Don’t overthink or overact…just follow a plan.